It’s been another snowy day here, although the temperature got up to 50 F and the snow is rapidly melting. We foresee mud in our futures! This morning, our Internet service went out again. 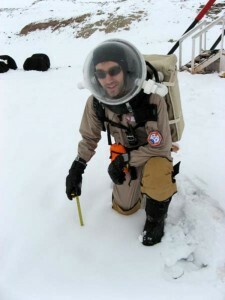 Brian and I suited up to go out and again knock snow off the satellite receiver. Rather than going through all the trouble of an EVA (getting our suits on, depressurizing the airlock, going out, coming back, re-pressurizing the airlock, and getting the suits off) just for that, we added some additional useful tasks to make the most of our time. We also planned to measure the length of coax cable that Mike needed for connecting the new, taller radio telescope; measure the depth of snow accumulation; clean the mud off the ATV tires and test their operation in the snow; and experiment with the “VOX” (voice-operated) radio setting (which does not require push-to-talk). While we were getting ready, the snow must have melted or fallen off on its own, because Internet access was restored; but we decided to proceed with our plans and accomplish our other goals regardless. Outside, the whiteness was nearly blinding, even with sunglasses on. We discovered that we’d gotten 3 inches of snow from the storm yesterday! 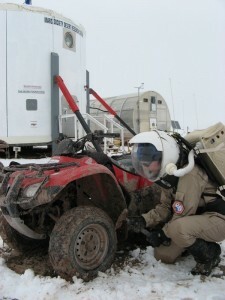 We cleaned off the ATV tires, inflated a few low tires, and then took the ATVs out for a spin in the Hab “parking lot” area. The snow was indeed a little slippery, but we found they felt okay if we went slow. More challenging was the fact that everything was unvaryingly white, making it very hard to tell where the ground sloped up or down or where rocks were; the diffuse light meant no shadows and no relief! We think we may be able to drive on nearby Lowell “Highway”, but probably not any of the side trails, where getting stuck would be quite likely and quite inconvenient. We came back in and then everyone assembled for a pre-lunch Jazzercise session. This was a total blast! We folded up our dining table and laid five mats (normally used for padding under our sleeping bags) on the floor. Five mats because Luis has been feeling under the weather and instead alternated between operating the video camera and cheering us on. 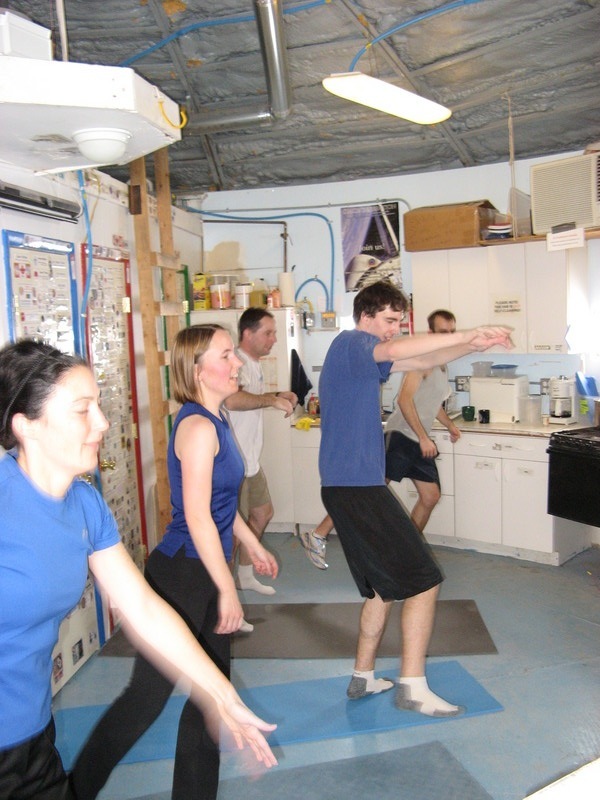 I put in the first Jazzercise DVD and we ran through several routines, stretching and jumping and kicking and breathless with laughter at how ridiculous we must look. (We’re wondering whether anyone was watching the webcams at that time!) We then sat down for some tortilla soup. Brian made tortilla chips by slicing tortillas and microwaving them — I didn’t know you could do that! They were nice and crunchy with the soup. Carla made a divine pear spice cake that was so good we can’t wait to have it after dinner as well. 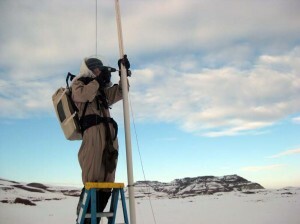 After lunch, Mike and Carla went outside for another EVA to raise the south poles of the radio telescope (to 20 feet tall). They also installed the coax cables and checked the tension on the support lines. The frozen ground made adjusting some of the support lines impossible, so this will have to be done during a future EVA. 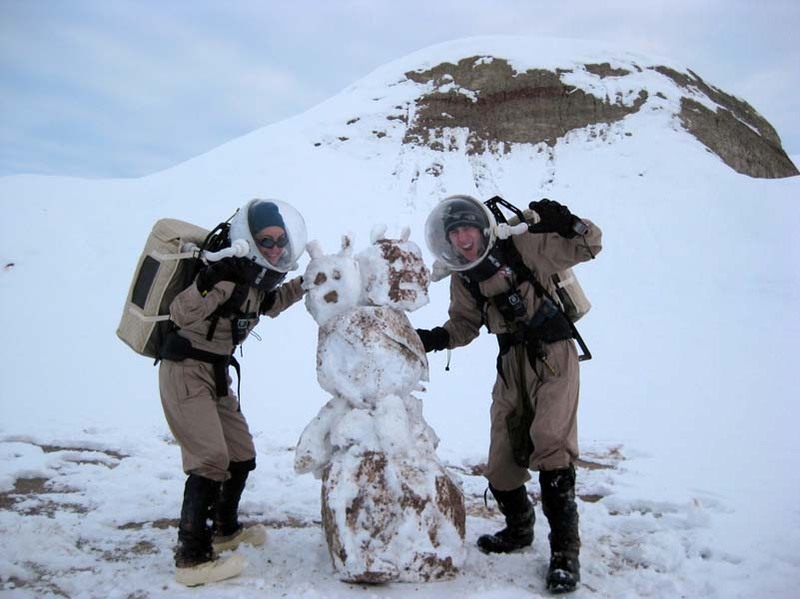 As a reward for their hard work, they then constructed a custom Martian snowman with two heads. We could see them from the Hab porthole windows! Carla and Mike built a Martian snowman! Meanwhile, The Viking-2 ATV has been inoperable for some time, so Darrel thought he would see about fixing it. Darrel removed Viking-2’s carburetor and he and Luis disassembled it for cleaning. They then boiled it on the stove in soapy water, scrubbed the pieces with a toothbrush, and boiled it in clean water. It is now drying and will be reassembled and tested later. Soon we may have four ATVs instead of three! Carburetors aren’t the only things cooking in our kitchen tonight. Darrel previously cleaned out the breadmaker tray (which was, let us say, simply disgusting), and we currently have whole wheat bread with garlic and oregano baking. Brian is making fried tofu and couscous that jointly smell absolutely divine. Darrel, Mike, and Luis are outside doing engineering rounds. Apparently the clouds have rolled away and the moon and stars are putting on quite a show, so they also took a camera and tripod to capture some night shots. With luck, we’ll all get our reports in early enough to watch another movie tonight. Anything would beat last night’s movie (“Stranded”). Really, *anything*! Posted in: Astronomy, EVA, Maintenance.